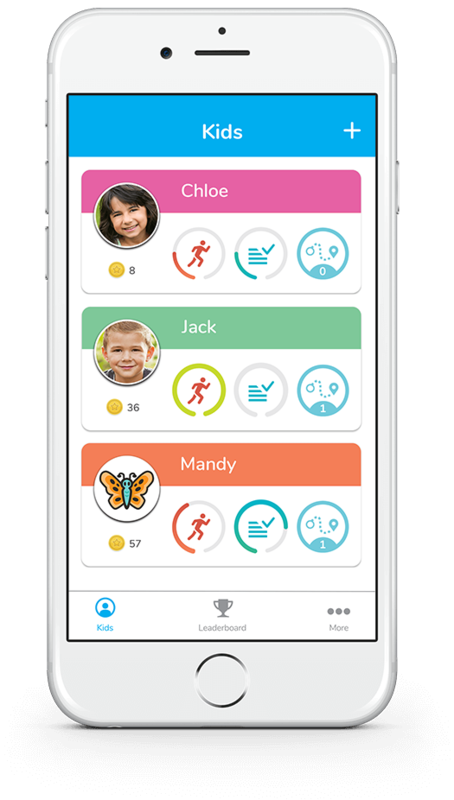 With the parent-controlled vívofit jr. mobile app, you monitor your kiddo’s steps and active minutes¹, assign chores and even hand out virtual coins that equal customizable rewards. It isn’t all for the grown-ups, though. 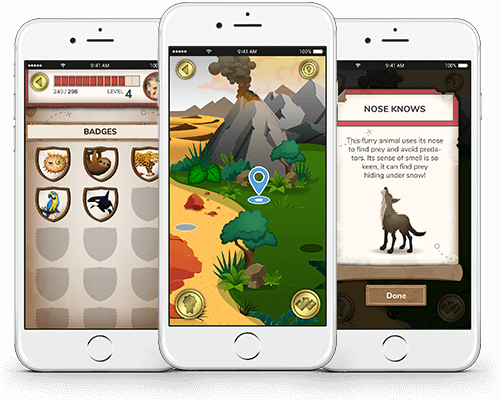 Kids will love the app for the exciting app adventures and games they uncover by meeting their 60-minute daily activity goals. They’ll try to out-step you every time in the app’s family steps and active minute challenges and unlock new step character icons by completing missions in the app adventure. The mobile app lets parents manage the key functions of vívofit jr. activity tracker. From here, you can add individual profiles for each child to see their steps, sleep, daily active minutes and chore data. 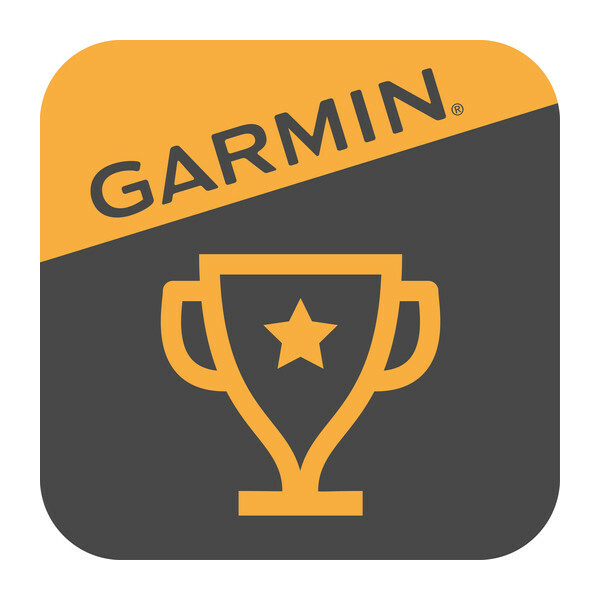 All the information syncs periodically to your mobile device when in range, so all you need to do is open the app to check everyone’s progress. With a Marvel Spider-Man band, your kid can save the world with their favorite hero. 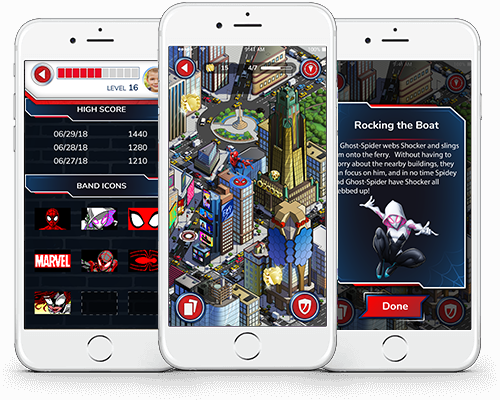 Meeting their 60-minute daily activity goal lets them take part in new app adventures and explore the different dimensions of the Spider-Verse alongside Spider-Man himself. They’ll swing across the city as Peter Parker’s sidekick, fight Vulture with the help of unexpected allies and track down the Green Goblin once and for all! The more they meet — and exceed — their activity goal, the more of the story they’ll get to see and the more of the world they’ll unlock. Meeting their daily activity goal also gives your kid more chances to play fun games and collect gems they can use to restore missing parts of the city on the adventure map. With a Disney Princess band, children will get to dream big like their favorite princesses. By meeting, or even exceeding, their 60-minute daily activity goals, they’ll unfold new adventures and uncover the different magical kingdoms with Ariel, Belle, Jasmine, Mulan and Rapunzel. They’ll help Rapunzel and Flynn Rider escape Mother Gothel, save the Emperor with Mulan and even explore the Cave of Wonders with Jasmine. 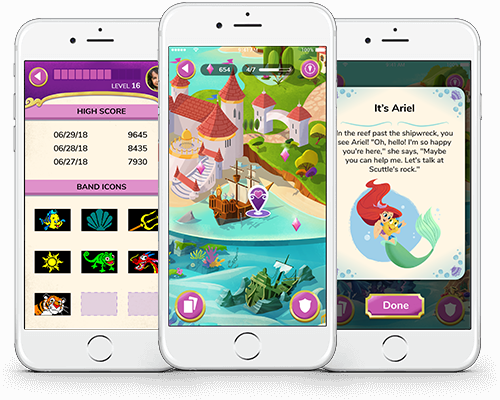 Meeting their daily activity goals also gives kids more chances to play a fun tap challenge game and collect gems to reveal their very own kingdom on the adventure map. 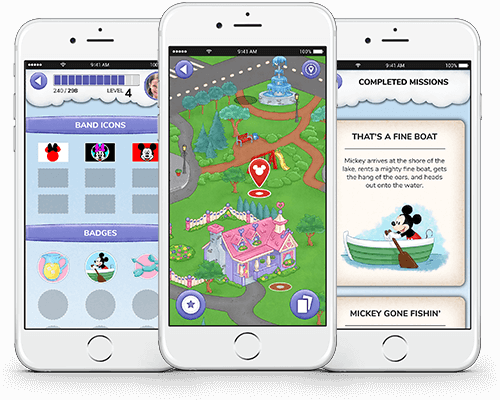 With a Disney Minnie Mouse band, for every day they meet their 60-minute activity goals, kids get to advance and experience new Disney Mickey Mouse and Minnie Mouse app adventures. They’ll help plan and get everything ready for Mickey Mouse’s surprise birthday party by baking a cake with Goofy, decorating with Daisy Duck, tracking down birthday presents with Pluto and much more. 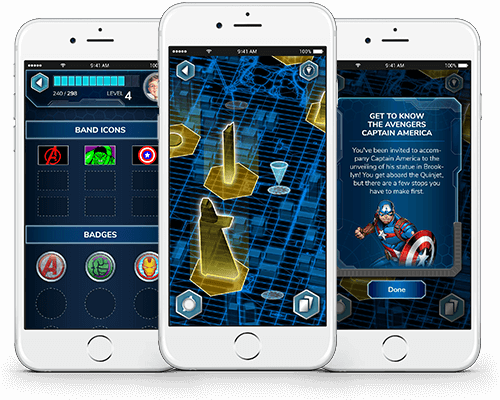 With the Captain America or Marvel Avengers band, kids will find the motivation to meet their daily 60-minute activity goals, thanks to the fun app adventures. For every day kids meet their goals, they advance through the story and uncover new app adventures and icons. 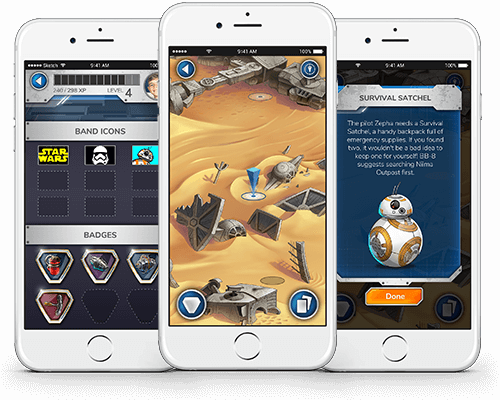 With the BB-8™, The Resistance or The First Order™ band, for every day kids meet their 60-minute activity goals, they move forward and discover new Star Wars app adventures. They’ll go along with BB-8 and the pilot Zepha as they tackle adventures on the planet Jakku. Search abandoned starships for missing parts with BB-8, meet the smuggler queen, Maz Kanata and much more. With any original vívofit jr. band, your kids can explore different habitats and learn fun facts about animals. For every day kids meet their 60-minute activity goals, they’ll advance further and uncover more fascinating animals. Take the fuss out of household responsibilities by letting the app do the work. 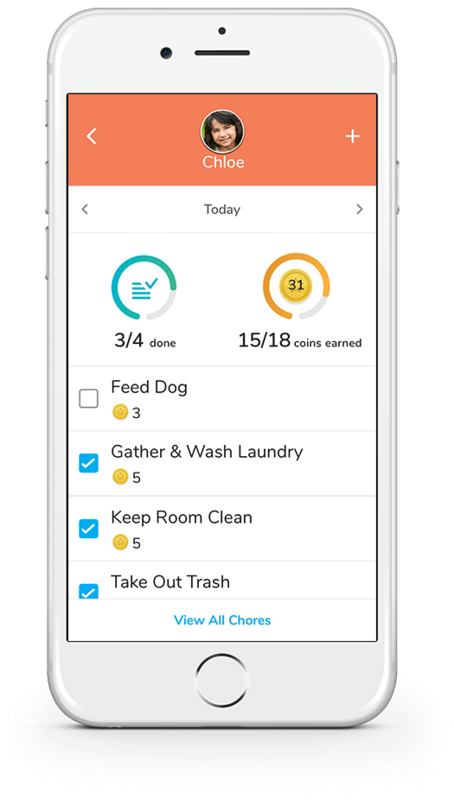 Assign chores right from the app by choosing from a preloaded list or creating your own. Choose how many virtual coins each task is worth, and set them to recur daily or weekly. You can also set schedule alerts that appear on their devices to remind them — along with an icon. Kids can see on their bands the number of completed tasks for the day and the number they still have to complete. Is your child ready for a little extra responsibility? 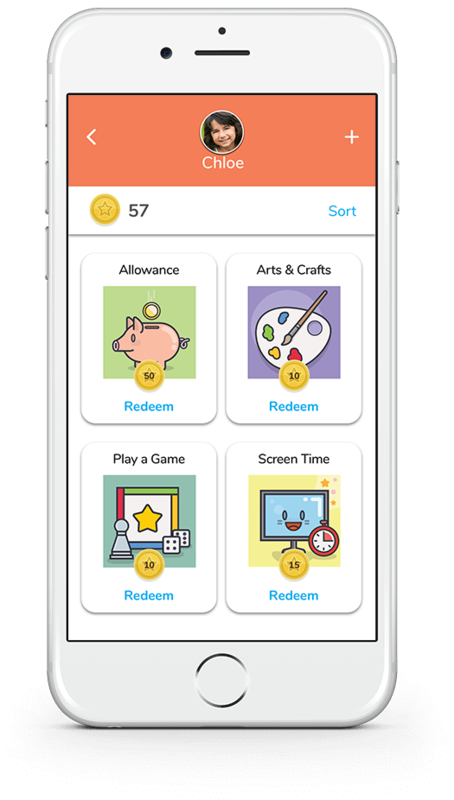 By enabling Kid Mode in the vívofit jr. app, you can give your kid limited access to monitor and check off their own chores and view the latest mission in their app adventure. It’s simple. Just sign in to the app on your child’s device, turn on Kid Mode, and create a passcode. The passcode is needed to modify chores and change coin amounts, so your kiddos won’t be able to alter those features without your permission. The app lets you designate custom rewards that youngsters can score in exchange for their hard-earned virtual coins. It’s up to you how many coins it takes to earn a play date, a movie night or a new toy. Kids can easily check their virtual coin caches right on the bands — and giving them goals to work toward will motivate them. Family challenges give your family extra motivation to move! Connect to other families so you can challenge them, too! With the vívofit jr. app, you can invite members of families you know, or even your Garmin Connect™ friends, to custom challenges. Challenge leaderboards will show you who’s at the head of the pack, and you can leave comments for each other to keep everyone motivated. Also, when you connect with other families, you’ll compete in an ongoing weekly steps challenge against them, giving you more reasons to stay active as a family. The app experience corresponds with the style of band you choose. That means the fun never has to end. 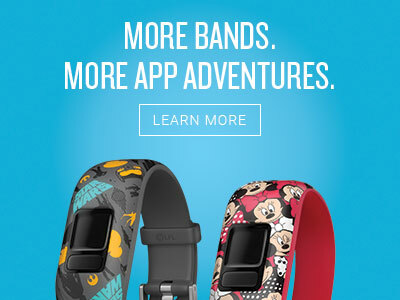 Purchase additional vívofit jr. 2 bands to let your kiddo enter a whole new world of app adventures and games. Apple is a trademark of Apple Inc., registered in the U.S. and other countries. Android is a trademark of Google Inc. Amazon and all related logos are trademarks of Amazon.com, Inc. or its affiliates. Available for download in the Amazon Appstore. App Store is a trademark of Apple Inc. Android is a trademark of Google Inc. Amazon and all related logos are trademarks of Amazon.com, Inc. or its affiliates.